At Kerridge Commercial Systems (KCS), we're passionate about providing a friendly and cooperative working environment for all of our employees. Take a look behind the scenes at a typical working day at KCS and discover why we are continuing to attract people from a wide range of backgrounds. If you're interested in joining our growing team, see our current vacancies. I determine the range of tests to carry out from the specification or the replication document and also based on knowledge of the systems functionality and how the customers will use it. Occasionally changes are also demonstrated to the customer either via screen share and conference calling or in a face to face meeting, so I also get to demonstrate the functionality which I have tested. What do you like best about KCS? The other staff members are amazing here and it quickly starts to feel like you are part of one big family. How long have you worked for KCS? I’ve worked with KCS for 6 years. Working within PSG Implementation always presents you with a different challenge each day working with different customers in different industries. I primarily manage a team of 7 Finance Implementation Consultants, acting as a mentor and coach on the various projects they are working on. I also work closely with the Trading Implementation Managers and Head of Projects reviewing and improving processes. Watch the video and read more. About a year now (11 months and 22 days). That would definitely be the people. I quite enjoy that I get to have informal conversations with my colleagues, managers or Director, and have a good laugh. 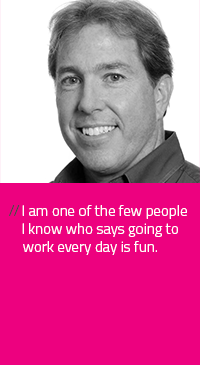 That makes the day much more pleasant, especially when you work in a fast paced environment. How have you found your time at KCS? 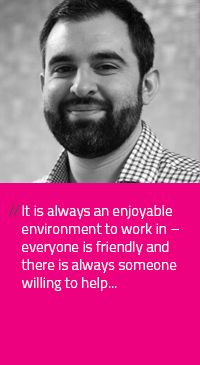 Working in such a diverse company and office means that no matter what question I have, everybody is more than happy to help, even if it is just by pointing me in the right direction of the person who knows best about my query. What are your tips for others who’d like to join KCS? Don’t be afraid or feel like you’re “not quite there yet”. KCS have set up their Apprentice and HNC/HND scheme for people who would like to work and study at the same time so there is never any pressure as to what level you’re coming in at, they really ensure it is dealt with on a case by case basis. I have worked for the company for over six years. I originally worked for Datawright as a Graduate Software Developer until we became part of the KCS group. As a Team Lead, a good portion of my day is spent ensuring my team has everything they need to progress with their work. This can include team or 1-to-1 meetings, discussions with other departments & managers and assisting with any issues that might arise. I started working for KCS in November 2014 as a Technical Support Analyst. 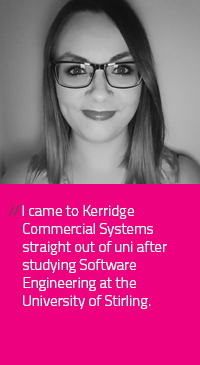 I came to Kerridge Commercial Systems straight out of uni after studying Software Engineering at the University of Stirling. Most days start the same, catch up on emails and any work that may have come in from the night before. I usually spend the first half hour of my shift prioritising my workload and ensuring I have all the relevant information I need for any calls I work on that day. How long have you worked for KCS Group? I have been with the KCS Group since March 2012. 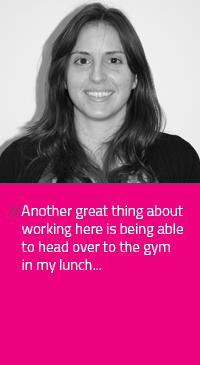 I originally moved here from a K8 customer, joining the Support Team as a Trade Support Analyst. 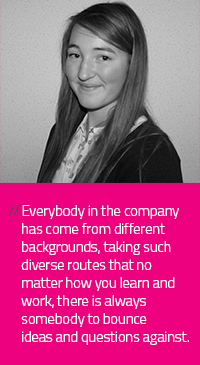 About 2 years later I grew into a more administrative role, liaising closely with customers and the Support Team. KCS Group has such an exciting growth path, that change is truly a constant. 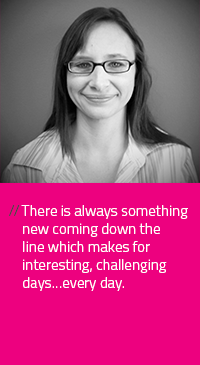 There is always something new coming down the line which makes for interesting, challenging days, every day. People. My role requires me to engage with people on a day to day basis. Since the acquisition and the integration of all staff, I am assured that we have loads to look forward to in the future as we continue to synergise. KCS have a family view about their staff and are always transparent, making one feel very appreciated to be a part of such a successful organization. What would be useful for new hires to know about KCS? Kerridge Commercial Systems is a team orientated working environment, always encouraging one to ask questions and happy to assist at any time. Most days begin with a brief discussion with the developers on my team to review progress from the previous day, resolve issues, and set priorities for the day. I may meet with Account Managers to review implementation questions and issues, or to discuss modification/enhancement requests received from customers. I could also meet with Customer Service Reps to guide them on how to research and resolve a customer support call involving one of our new applications. Since the primary task for our team is to bring new technology and ideas into our systems, I try to spend time every day learning something new. 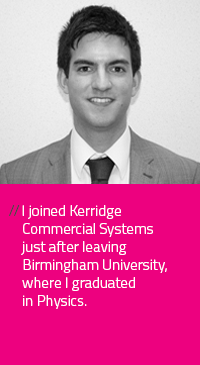 I joined just after leaving Birmingham University, where I graduated in Physics. The people. Everyone here is ready to help, and I think that’s really critical for success. Because of how comprehensive our product is, we need to be available to help each other at all times.